Unhappiness-sadness-lose of interest-risk taking-anger-isolation-loneliness-These are the signs that we might recognize in someone who is contemplating suicide. But these aren't on the face of suicide. A person can be so private and so filled with hurt that these are hidden. They may not be reaching out for help. They are right there with the group, learning, laughing, but so very unhappy. But we don't know! Suicide touches the community at a deep level. Leaving friends and family with ragged feelings that can haunt them for life. Prevention and awareness campaigns are available, however, sometimes a person is trapped in silence and darkness. Privacy is respected and a person is lost to suicide keeping their thoughts a mystery. As 4-H agents, we often have youth who commit suicide. When a parish has 100's of teenagers enrolled, it often happens. It's a hopeless feeling. Going back through 4-H camp photos and seeing the cheeky smile of a lost 4-H'er is haunting. We begin to reflect and ask our selves, what did we miss? Did we notice changes or calls for help? How can this be prevented? What can be done for the children who are are also searching for answers? Some might argue that 4-H agents aren't therapists and we shouldn't be counseling children and families about suicide prevention. But we share close ties to families who have suicide and we can be compassionate and understanding. One positive message can be supportive and this is something that agents can safely do to help with the aftermath of suicide. Educators are partners. Suicide prevention is everyone's business and if we suspect that a child needs support we should respond. Talk. Call a parent or a teacher. Get involved by being an advocate for the child. It is uncomfortable and maybe there will be high emotions, but it's better to reach out than to sit back. It's important to recognize that we need to educate ourselves and be prepared to help. Read and share information as a community. The web is filled with solid research based information that is a click away. Please see the list of resources at the bottom of the page for suicide awareness information and resources. 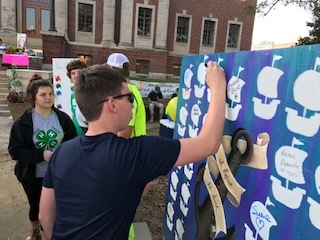 The photo above is of a 4-H member signing a board for a family member or friend that has lost to suicide. 4-H teen leaders are learning about the signs and symptoms that might assist them in helping out a friend or family member. 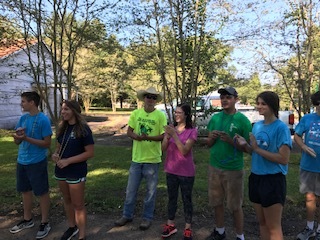 The 4-H members in the photo above distributed water to walkers in the Out of the Darkness Suicide Awareness event. The teens cheered on community members who walked in memory of a loved one lost to suicide.